Achiya was created to respond to the growing phenomenon of youth who suffer because their developmental and learning deficits were not recognized in time to help them get back on track in school. Community leaders recognized the challenge, and established Achiya with the blessing and encouragement of rabbinic leaders. Achiya responds to learning challenges when they are first apparent, before they become fixed patterns, and more difficult to change. Achiya created unique methods for its Learning Centers, suited to the needs of children in Talmud Torah schools. The teachers at Achiya Learning Centers successfully apply these methods for the benefit of all. Achiya leaders have expanded the vision with a focus on teacher training—nurturing nurturers. Achiya’s years of in-depth experience in the field provides teachers with the latest knowledge and practical tools for their sacred mission. Achiya’s Child Development Centers provides physical, occupational, emotional and language therapies to meet developmental challenges and provide early intervention that enables preschool children to thrive, grow and adapt themselves to keep pace withtheir peers. Our progress continues: Achiya’s early detection and intervention programs identify developmental challenges and treat them in time. These programs are implemented in Talmud Torah schools and preschools. To complement Achiya’s full range of treatments, a hydrotherapeutic swimming pool was built in the Bnei Brak center to serve children and adults coping with functional and developmental deficits. The pool is an especially efficient and user-friendly therapeutic tool — the natural qualities of water promote the success of treatment both in terms of functional abilities and morale. Achiya conducts seminars and educational activities throughout Israel for educators and the community at large. Achiya’s pedagogical website (www.achiyayeda.org. ), available to all, is widely recognized by educators from Israel and more than 40 Jewish Communities abroad. Educators enhance their toolbox and entire communities are empowered. 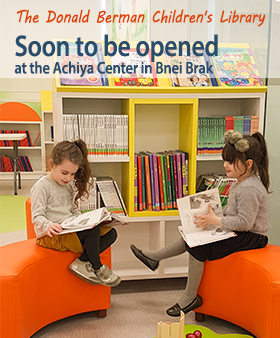 Achiya’s Children’s Library, soon to be opened, will be accessible to children of all needs. It will be a meeting point for normative children to socialize with children with special needs, in an enabling, fun, and fully integrated atmosphere. In addition to Achiya’s initiatives in Israel, our work has drawn the interest of Jewish communities abroad including the U.S., Europe and South America. At Achiya, we do not rest on our laurels. We work steadily to develop programs to meet the challenges of our time, responding to individual needs so growing numbers of children in Israel and overseas may learn that they can succeed.